When is bad news good business? When it’s about the emerald ash borer and you’re in the tree business. Billboards went up around the Twin Cities this week for eabexperts.com, which turns out to be Rainbow TreeCare, of Roseville and Minnetonka. That’ll run you about $200 per tree. On the other hand, removing a tree can cost $1,000 and he says keeping the tree alive for a few years can give you time to put the money aside to take it down. Should you cut down your ask now rather than wait? “It depends on the value of the tree in your landscape. If you’re asking yourself the question of whether it’s worth saving or not, to me it’s not worth it,” he said. “And plant what?” I asked. Not all ashes are created equal in the eyes of the emerald ash borer, however. The mountain ash, Korean mountain ash, and European mountain ash are not susceptible to EAB. The white ash, a native tree in swampy areas up north, the American ash, and the black ash, however, are in trouble with the infestation. 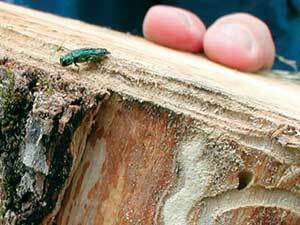 Here’s the company’s emerald ash borer fact sheet with more information. Here’s more EAB information from the University of Minnesota Extension Service. Once all untreated Ash trees die in area, you can slow down, then stop treatments FOREVER! Unlike DED for Elms, Ash has no bush version to survive on. What do you think michigan state went through, by loosing all ash. They sacraficed for us to find better answers. If this was happening to Oak, things would be different. Look at Elm situ, with treating every three years when uncompartamentalised spores break loose into same tree again, because never cut out of branches. Standings are Oak, Elm then Ash, Linder, locust, Hackberry. Forgot Cottonwood, which should be on top for most important to evolution of prairie and making dirt on top of sand dunes. Green lives over 300 yrs & White 6OO. Lets work together, not for broke government giving up in each town EAB hits. City saved ours. Thanks Chicago!